It Is What It Is: Happier Birthday to YOU! 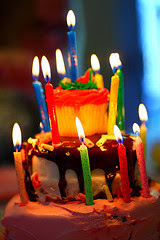 You cannot stop growing older but you can celebrate your birthday by making it an event, even if it is an event for one. I know people do not like to make a fuss necessarily in front of others, but how about taking your birthday to another level and making it a special day for YOU. After all, you probably spend most of your time doing everything else for everyone else. You deserve to be “birthday girl” or “birthday boy” one day a year. My friend Lynn had a birthday last week and was feeling a bit blue. When I asked her what she had planned she said, “Nothing out of the ordinary.” No wonder she was feeling blue. As for myself, I love being the “birthday girl,” opening the cards, receiving phone calls from family and friends and just making a point of doing something special for me. Here are a few tips for making a happier birthday for YOU! First of all⎯if it’s a workday⎯take it off! There have been a few times I have worked on my birthday and I regretted it. Even if I was going out to dinner for the evening, working did not make my day special. I needed the WHOLE day. Don't forget the cake! Each year I bake my own cake. Yes, you heard me right. I made the mistake a few times by actually making my cake on my birthday⎯not advisable because that might be considered work and does not qualify as celebrating your birthday. So, I make the cake ahead of time. I start a month or so ahead planning what kind of cake I might like to have. I find this adds to the whole fun of celebrating. If you don’t care to bake the cake, pie or whatever yourself, perhaps you would enjoy ordering a special something from the bakery. I’m sure you get the idea. You don’t have to spend a ton of money. Simple is best. It is in the simplicity in life where we find our best self. As for Lynn, I didn’t think she should have to wait a whole year before she could plan HER day so I suggested she pick another day soon, call it her re-birthday and plan accordingly. What have you got planned for your birthday? Don't let another one just slip by. There is only one you and I think you deserve to celebrate!